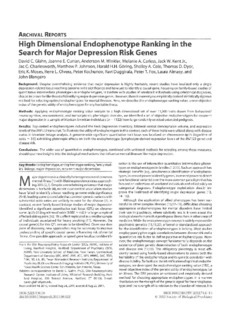 Background: Despite overwhelming evidence that major depression is highly heritable, recent studies have localized only a single depression-related locus reaching genome-wide significance and have yet to identify a causal gene. Focusing on family-based studies of quantitative intermediate phenotypes or endophenotypes, in tandem with studies of unrelated individuals using categorical diagnoses, should improve the likelihood of identifying major depression genes. However, there is currently no empirically derived statistically rigorous method for selecting optimal endophentypes for mental illnesses. Here, we describe the endophenotype ranking value, a new objective index of the genetic utility of endophenotypes for any heritable illness. Methods: Applying endophenotype ranking value analysis to a high-dimensional set of over 11,000 traits drawn from behavioral/neurocognitive, neuroanatomic, and transcriptomic phenotypic domains, we identified a set of objective endophenotypes for recurrent major depression in a sample of Mexican American individuals (n�=�1122) from large randomly selected extended pedigrees. Results: Top-ranked endophenotypes included the Beck Depression Inventory, bilateral ventral diencephalon volume, and expression levels of the RNF123 transcript. To illustrate the utility of endophentypes in this context, each of these traits were utlized along with disease status in bivariate linkage analysis. A genome-wide significant quantitative trait locus was localized on chromsome 4p15 (logarithm of odds = 3.5) exhibiting pleiotropic effects on both the endophenotype (lymphocyte-derived expression levels of the RNF123 gene) and disease risk. Conclusions: The wider use of quantitative endophenotypes, combined with unbiased methods for selecting among these measures, should spur new insights into the biological mechanisms that influence mental illnesses like major depression.